These are the words of Insular Life Executive Chairman Nina D. Aguas, as she issued a challenge to employees to be disruptors during the Company’s innovation conference. Dubbed as Innovating Solutions for the International Pinoy (ISIP), the conference was the second such event that Insular Life convened in a span of less than a year. The goal of this activity was to immerse the Insular Life community in new trends in technology, innovation, and the importance of digitalization. Ms. Aguas, in her speech, noted that rapid developments in technology and business models are forcing companies to adapt to these changes. Good companies, she said, let their employees ride the tide; but great ones allow their people to create the waves themselves. Among the powerful speakers and industry captains were Union Bank of the Philippines (UBP) Chairman Justo A. Ortiz, who talked about UBPs transformation journey; Harvard and Yale-educated techpreneur Manny Ayala, who discussed emerging trends in startups; and Singapore-based venture capitalist Justin Hall, who talked about the future of financial technology and where the big opportunities will come. 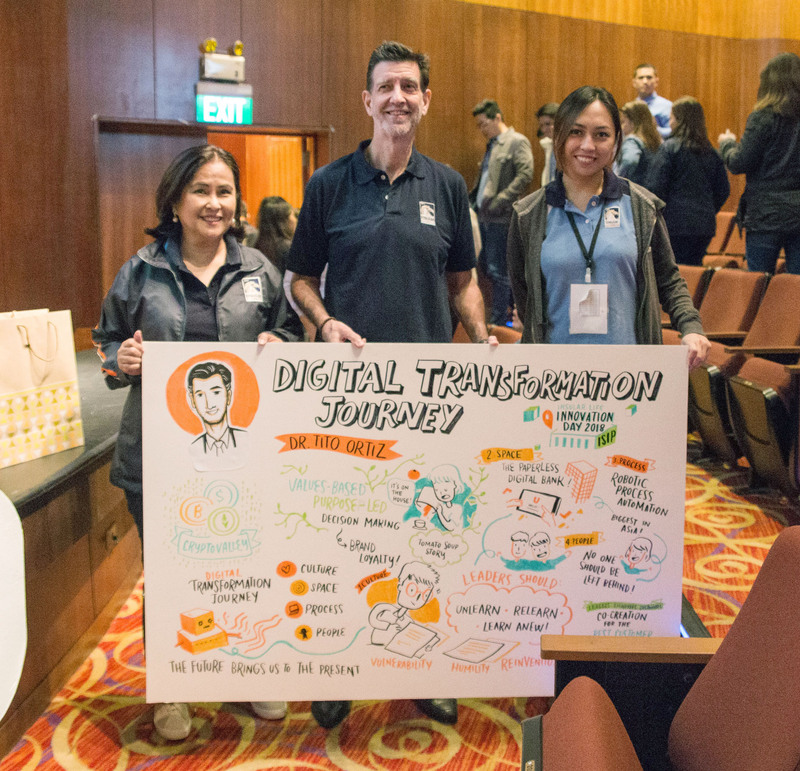 After the plenary sessions on digital transformation, financial technologies and the startup world, employees were also given the choice to attend breakout sessions that piqued their interest in topics such as: Intrapreneurship & Solving Problems; Digital Sales & Branding; Fintech, Blockchain & Bitcoin; and Design Thinking & User Experience. The breakout session speakers were Mynt Vice President for Marketing Chris Manguera; Storm Learning CEO DM Varun; Style Compass founder Abbie Victorino; Machine Ventures CEO Shahab Shabibi; and Qwikwire founder Ray Refundo. Hundreds of Insular Life employees gathered at its Alabang headquarters for ISIP. The conference was livestreamed so that employees from its branches nationwide and those who could not physically attend would not miss the talks from some of the country’s top leaders in innovation and technology. Insular Life Executive Chairman Ms. Nina Aguas, left, presents the visual summary board to UnionBank Chairman Mr. Tito Ortiz, moments after his digital transformation talk. With them is Insular Life Head for Innovation Ms. Fam Alonto.